BANDWAGON and the secondary market for tickets are disrupting the status quo for selling or buying a ticket to a college football game or sport event while at the same time capturing insightful and transparent buyer and seller identity data to help optimize best practices for business efficiency. Game day experiences and the fan experience are evolving thanks to advances in technology which is what company Founder and CEO, Harold Hughes, brought to market as a resource during last season’s National Championship by Clemson University, his alma mater. This season most all the universities in the Power Five conferences are onboard much to the delight of fans and administrators alike because the control over who purchases tickets is given to ticket owners while buyers can seek seat criteria to their liking such as sitting in the student or alumni sections, home or away seats, and the family friendly area. Perhaps you know a storm is brewing before kickoff (our hearts go out to the people, animals and businesses of Texas and the surrounding areas of Houston because of Hurricane Harvey) and want to sit under cover or in the shade if the weather calls for a heat index of triple digits. Bandwagon specializes in providing seating in the section of your choosing. The Sports Techie community chatted with Hughes about his startup, their Blockchain based solution tech and the future of ticketing. BANDWAGON helps fans optimize the game day experience by allowing them more control over the purchase of tickets – both for sellers and buyers. BANDWAGON is a sports tech company with a fan-to-fan marketplace that helps you protect home field advantage and create the ultimate game day experience. I bought a secondary market ticket last week to the Seattle Mariners game versus the Atlanta Braves at SunTrust Park for $3 with no service fees from TickPick. When the barcode was scanned on my iPhone, the MLB team lost an opportunity to drill down on who I was as a secondary market consumer, an opportunity Bandwagon hopes to capitalize on and a feature their competitors don’t offer yet. I also was not able to find out the section, rows and seat (s) M’s fans were sitting at so I could not purchase a ticket near them. The Braves charge an average of $20 to park at the new stadium without additional fees included. I conducted an online search and found the cheapest lot nearby priced at $10 with another $3 added on in service fees. This was a MLB BallPark app approved primary ticket vendor transaction via Ticketmaster. 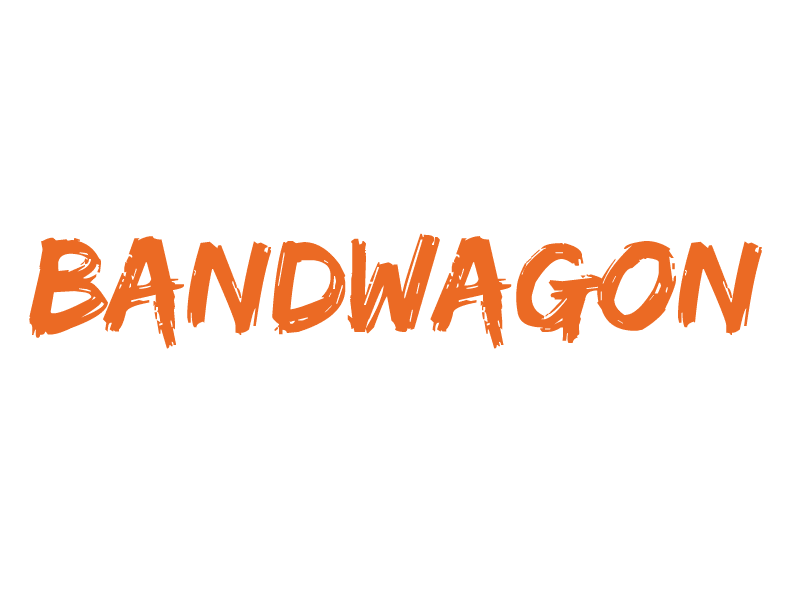 Bandwagon offers these types of fan engagement and facility management services, and much more by charging sellers $10 per ticket sold and collecting 15 percent from buyers in fees from the listed ticket price. 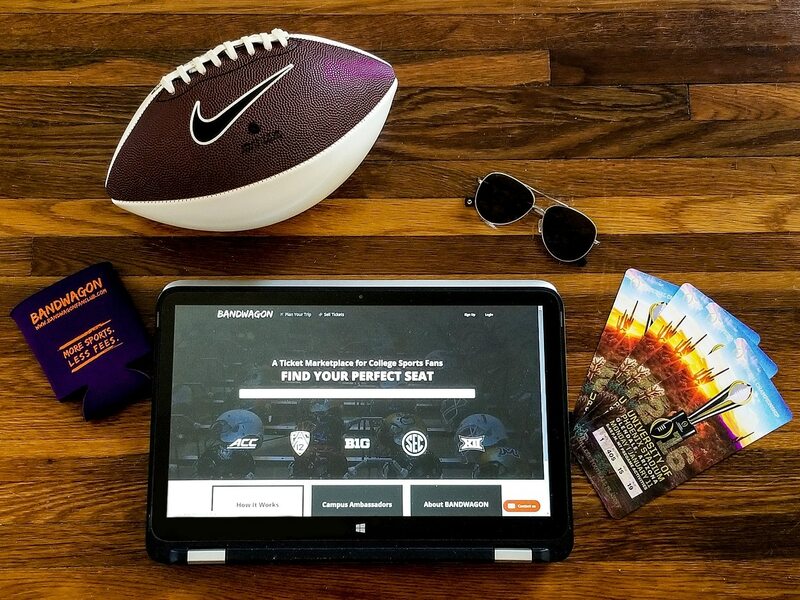 Whether you are interested purchasing a ticket to a home game, or planning a roadtrip to a college football away game in the ACC, Big Ten, Big 12, Pac-12, or SEC conference, or want to call on a rideshare, or simply need assistance finding cheap or safe parking, Bandwagon is your one-stop shop. Hughes says his proprietary web-based platform developed in Greensville, South Carolina by a four-person team, also offers guaranteed protection from ticket fraud, a frustrating occurrence plenty of fans have experienced at the gate because of purchasing a fake ticket from a rival site, app or broker that has no such guarantees in place. BANDWAGON and the secondary market for tickets are disrupting the status quo for selling a ticket to a college football game or sport event. College football programs sales and marketing departments need to know about blockchain technologies and algorithms. I had little knowledge about this tech before speaking with Hughes and conducted my own research to understand it better. Basically, blockchain is a digital ledger and constantly evolving list of records or blocks, linked together and made secure by cryptography. Most know blockchain as the secure web solution or engine that enables transactions to occur in bitcoin or other cryptocurrency that are recorded in a chronological order and made public while also being open source, much like Wikipedia. Bandwagon allows approved users to input entries to add to information records. Their community of college clients is given control over the process of adding, changing or deleting updates. Using the Wikipedia example, no single publisher controls the entries making the addition of information a collective effort to maintain. By implementing blockchain development, Bandwagon can provide more visibility on identity of who is in stadium across multiple data bases. The various secondary market players like StubHub and Vivid Seats are not talking to their clients about collaborating and sharing a database to see value which Hughes feels is hurting the market. By instituting various platforms, the school can see who the buyer and seller are, while eliminating fraud purchases. Hughes says he can access seat identity info such as buyers and seller demographics by deriving each person’s preferences gathered by their custom ticket selection process. College and professional sports programs are able to create a new stadium identity generated by the actual ticket user fanbase creating tailor made marketing opportunities to fans actually sitting in the seats rather than the original season ticket holder or individual game holders. Hughes feels their marketplace metrics are unique creating a more personalized gameday for all parties involved during a ticket resell transaction using their product. Head over to the Sell Tickets page and use the search tool to find your team. On the team’s page, click the “Sell” button for your game. Fill out the ticket listing form to tell us about your tickets. We’ll also add some extra seat characteristics to sweeten the pitch (ie. family-friendly, home/away, etc). You can even make sure a fellow fan buys them by enabling the “BANDWAGON Only” option. Now sit back and we’ll do the rest — and to top it off, you get more $$$ in your pocket because of our lower fees! Enter the name of the team you want to see in the search tool. On the team’s page, click the “Buy” button for your game. Find YOUR perfect seat by letting us know what matters most to you on game day (ie. cheering in the shade or amongst other family-friendly fans or on the home team side). I asked Hughes where the name Bandwagon came from. He said the negative connotation associated with the word was something he wanted to change by building a community of like-minded sections looking much like a checkerboard. 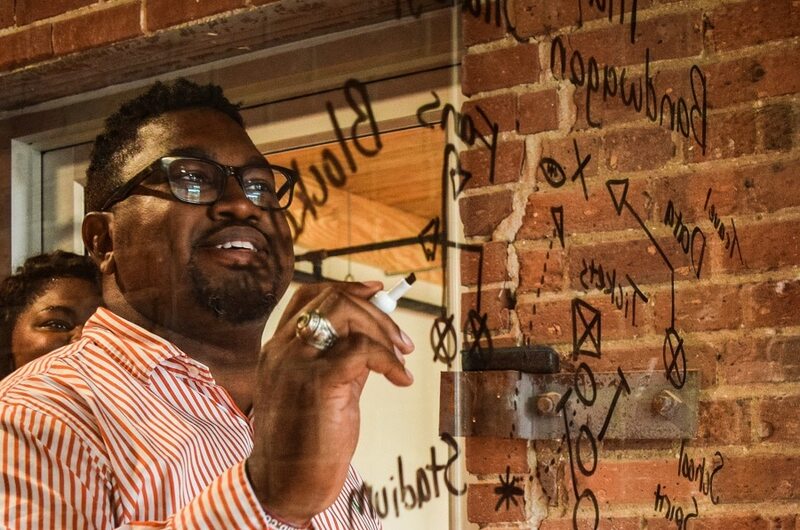 Thus far, Hughes has raised $500,000 from the Black Angel Tech Fund created by a Stanford alum, as well as Backstage Capital and Blue Vista Ventures located here in Atlanta. The beta test with Clemson was an unofficial tally last season that generated 2,600 users and $7,000 per month over the 90 day period then it was shut down because of running out of tickets. The school had 30,000 season ticket resales thus needs to continually create ways to find new fans and create new tickets packages at the same time accomplished by flipping the program over to blockchain. The next step was to scale the solution to be used by many schools at the same time. Currently, the Bandwagon solution has 250,000 tickets for purchase across across college football, including Clemson, Stanford and USC, Michigan, Oklahoma and Alabama. Some teams have more inventory than others. Part of the business model involves partnership with third parties. IdealSeat in Seattle and their qualitative seat data led by Joel Carben is one such partner. IdealSeat claims to be the world’s best fan intelligence platform. They accomplish their mission to create, analyze and deliver insights from unique data about the fan experience by implementing millions of proprietary data points then integrating advanced analytics to share data about fans with sports and entertainment platforms just like Bandwagon. Another key partnerships is with Vidii and the use of their Facebook chat bots. The goal here is to drive traffic to Bandwagon’s site using video clips and was just tested yesterday. The live gameday vidicon attendant was created to focus on 12 schools located in North Carolina, S.C., Georgia, Florida and Alabama. By building and learning through IBM Watson, it becomes easier and easier to find teams, sections, rides, trips, and parking. Croozen is a road trip app that helps Bandwagon customers book a road trip to games through ride sharing with a carpooling community as an alternative way to attend together with fellow fans as an inexpensive and user friendly option for travel. Travelers are able to connect and then share rides to live events helping to save transportation and parking costs as well as helping out the environment by reducing the carbon footprint of unneeded vehicles in the process. ParqU is a new platform that allows fans to conveniently reserve parking for college gamedays and major sporting events. ParqU is revolutionizing the pain point of paid-parking. Hosts are able to earn money by utilizing commercial and residential parking. If you own a business or home next to a stadium, this makes perfect sense. Fans can search for a coveted parking spot on the site or app, then make a cost effective reservation ensuring this task is completed before the event starts and price gouging goes into effect the day of the game. The ParqU parking tech enables each “host” to highlight their parking area much like Airbnb does for rental home owners. The app does all the required tasks such as finding, reserving and paying for parking. Once reserved and paid for, GPS functionality guides you to the sellers parking lot address completing a seamless journey to the game and ultimately sitting in the seat purchased on Bandwagon. Finally, plan your trip powered by UTrip. The idea is to click on, Plan A Trip, and use a local expert to find entertaining and relevant activities to do. Diana Falk is their first Bandwagon trip planning expert and is located in Phoenix. The use of artificial intelligence to find Craft Beer and Good Food and other fan experiences is expanding daily with with more things to do. I perused the Seattle and Atlanta trips and was more impressed with the Seattle UTrip experience overall. Hughes said an Atlanta expert was soon to be live with more things to do, see and eat, ideally before the Kickoff Classic. More experts will be enrolled over the football season to get more features using AI. Hughes finds there are still schools doing their own in-house ticket printing and not capturing user data such as who are alumni givers, then following up by asking for their financial support and possible donations. I was surprised his company does not have an app. Harold said it was a conscious decision to build an API and work with schools to integrate with their mobile responsive website. An app is something that will come down the road. The next vertical will be college basketball. Smaller cities and colleges are also in the developmental pipeline. A concept that Hughes wants to flesh out is to create a white label app for teams to capture fan data at a cost savings of $150,000 or more to willing programs. I queried about future opportunities with the NFL, MLB, NBA, and NHL. Minor league baseball makes sense, said Hughes, it is everywhere across the USA. Hughes plans to continue selling to conferences in college football and smaller schools before competing against official ticket resellers such as NFL Ticket Exchange powered by Ticketmaster verified and Major League Baseball Tickets. Their Campus Ambassadors program is a unique, internship offered both at the Bandwagon HQ and remotely in a virtual setting. Rather than walk around handing out Red Bull, Hughes offers a blended internship full of fan engagement. Interns can gather info and data on game day by surveying, all the while gaining valuable experience. In return, Hughes will help build up their portfolio including dialog about fund funding efforts, financial management, customer service, data capture, and having fun. The Campus Ambassador program is in its second year and runs during the school year and also has a summer version. Bandwagon is a Secondary Ticket Marketplace created by sports fans, for sports fans. 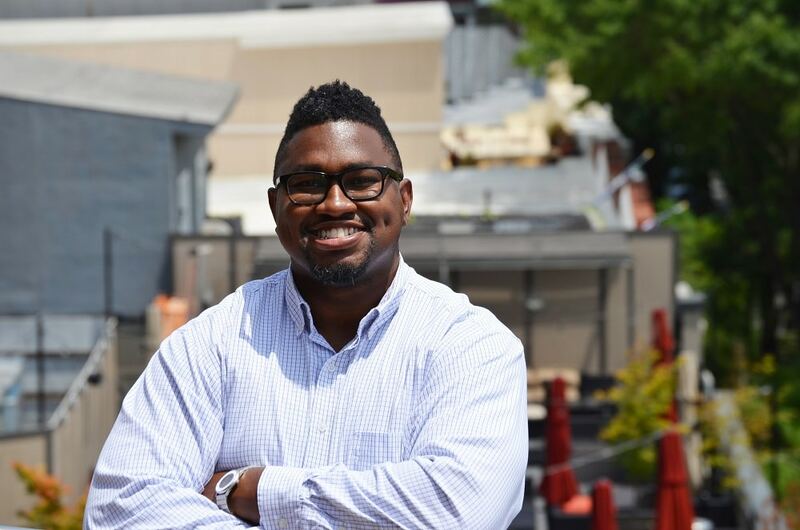 Sports Techie, Chick-fil-A Kickoff Classic game tickets between No.1 ranked Alabama and No. 3 Florida State at the new Mercedes-Benz Stadium this Saturday, September 2 at 8 pm are available via Bandwagon. Many of these seats are made available via Atlanta Falcons season ticket holders, says Hughes. Often tickets for the biggest games and events such as the College Football Playoff National Championship game comes down in price by gameday when two of the four teams are eliminated. Ticket holders from the losing teams are trying to liquefy their investments, much like what happened at the Mayweather and McGregor fight at T-Mobile Arena in Las Vegas last weekend because ticket prices were too high to meet actual consumer demand. Bandwagon can aggregate each ticket user’s data and help college football programs fill stadiums. Around 49 million folks attended college football games in 2016, accounting for the lowest average crowd attendance since 2000. Is cost a major factor? Of course, consider the median ticket prices in the SEC where the Crimson Tide collect $205 per seat while Texas A&M, LSU, and Georgia charge over $150. Each school also sees a ticket user as a bar code only, not an opportunity to collect robust data about each buyer and seller. By aggregating data, Bandwagon can pin point down the average ticket holder in each section. Hughes wears multiple hats and seems very good at performing them. His main role is Business Development and Chief Fund Raiser. That said, like most all startups, more investment money is needed and a next round is scheduled for February of 2018 after the current college football season. Once fans know Bandwagon is the place to secure the exact ticket they seek, fans will come back again and again. Buyers and sellers alike beware of this emerging ticketing trend setter, Hughes and his team will see to that.